Racine seems to have this mystical reputation as being one of the best non-high end French restaurants in London, and it was because of this reputation that my friend J wanted us to go. I have been once before, a long time ago, and while I didn’t think that the food was bad, I didn’t remember it being particularly memorable either. Racine always seems packed whenever I go past it, and so it felt like time to try it again. So did Racine live up to its reputation? In the décor stakes, I would say yes. The restaurant is cozy and warm, and the ambience sings a buzzing tune. The moment you walk through the door, you get the sense that you have been transported to some hidden romantic hideaway in rural France. 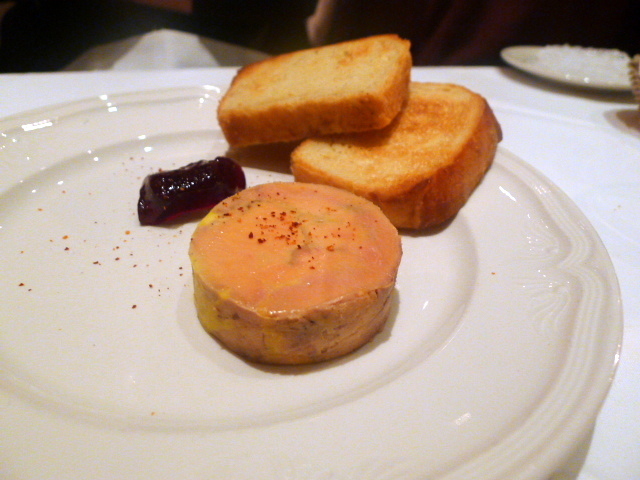 To start, a foie gras ballotine (£12.75) was rich in flavour and wonderfully creamy in texture, but the accompanying brioche was disappointing. Instead of being soft in the centre, it was dry and a little crusty. It also lacked the requisite sweetness. 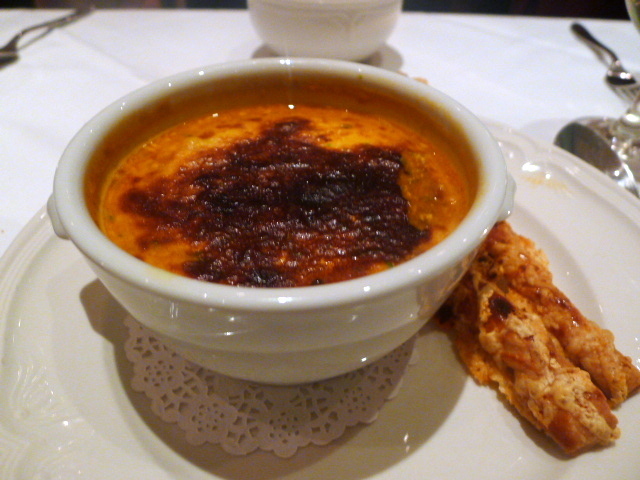 A crab bisque (£9.25) was rich with crab flavour and came with the right hint of creaminess. This was expertly prepared and highly enjoyable. It was finished a ‘gratin’ of cheese, milk and cream, the purpose of which I could not understand as it did little to enhance the flavour of the bisque. It also looked rather ugly and messy, and consequently detracted from the presentation of the bisque. 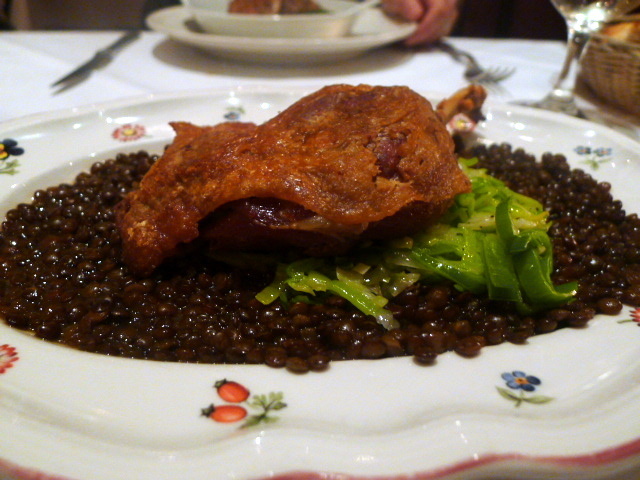 A duck confit (£17) came with crispy, crunchy skin, but was otherwise unpleasant to eat as it was incredibly salty. The over seasoning left the duck almost inedible, but otherwise the duck was tender. The accompanying lentils had a little bite to them, and would have worked better if they were a little softer. The leeks were soft, tasty and very buttery. This had the trademark of a good dish, but was ruined through carelessly preparation. 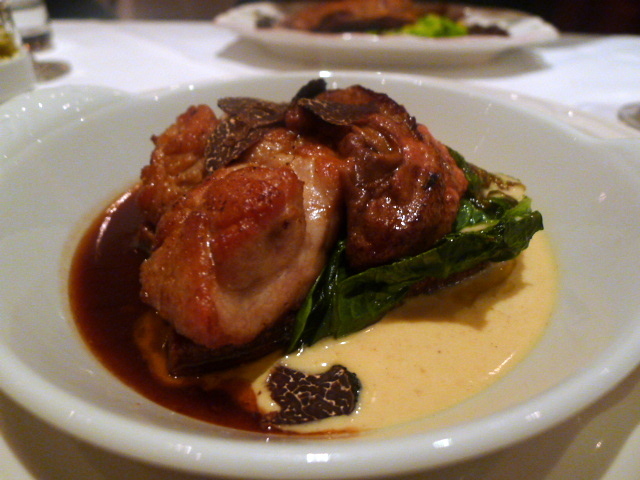 Pan-fried sweetbreads with foie gras was served over a slice of toast, and finished with shavings of truffle. The sweetbreads were firm and tasty, although the foie gras was slightly mushy in texture (and not just soft). The dish was accompanied with a jus made from game stock and brandy which was pleasant, but it was a touch salty and lacked the intensity of flavour that comes with a well reduced sauce. This dish was decent, but I had expected better from something costing £29.75. The service we received was very professional, knowledgeable and polished. But it was stretched. Ten minutes was a little too long to spend trying to get a waiter’s attention as we had to. The food service was also a little slow as well as the time between starters and mains was probably 20 minutes too long. Cheeky then, that Racine charges a ‘discretionary’ service charge of 14.5% rather than the more common 12.5%. Both the service and the food at Racine is good, good enough so that you can understand why it can draw in the crowds, but not good enough to justify the hype. The ballotine tasted wonderful, but the accompanying brioche was poor; the bisque was tasty but looked a mess, and so forth. No one dish completely hit the mark. Bistrot Bruno Loubet serves more accomplished cooking and is more reasonably priced. I didn’t love Racine, nor did I dislike it. For what they charge, the food at Racine hovers on the ok mark. It’s a Knightsbridge posh people’s favourite so no doubt it will always continue to be busy. For me, I can take it or leave it. Actually, I’d probably leave it. Price range: £33 – £51 for three courses. Excludes drinks and service. That’s interesting, I have found the opposite. Although everyone raves about Bistro Bruno Loubet I was underwhelmed and certainly service was less than stellar. I’ve been luckier with my 3 visits to Racine, food has been really very good each time. Service too though occasionally busy times mean harder to get attention, yes, though never taken more than a couple of minutes. Shame! I think I might just head to Bistrot Bruno Loubet instead. Hi Kavey, Yes a shame, but I’m glad you’ve had good experiences there. good to hear from you. Yes I agree with you on the value for money aspect – my sweatbreads dish was pretty pricey. And yes, I haven’t forgotten about your great memory. Shame you didn’t have a good time; I haven’t been myself but my parents went on Friday night and loved it, though they had different menu choices.